Lawnmowing season is upon us again. I managed to avoid it last year. I had surgery at the start of the summer and I had to get someone else to mow the lawn. Then when I went to mow the lawn this year, I discovered that my lawnmower needed servicing..so that was another few weeks' reprise. Where on earth have all the dandelions come from? My lawn was covered with them. They weren't there the last time I mowed it. But then again neither were Jedward the last time I mowed it! 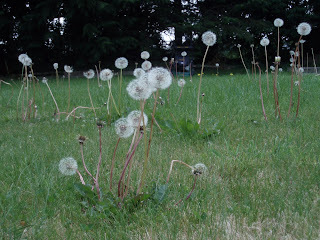 I've since discovered that the dandelions are a result of the artic conditions we had in the New Year. All the plants ie grass and weeds that were near the surface of the ground were all killed off. But the clever little dandelion seeds were lurking further underground and escaped the frost. Then when the warm weather came, the little blighters woke up, rushed to the surface screaming "Yipee. No competition", and are now taking over the lawns of Ireland. Anyway I mowed them out of it! Today I was sitting in my kitchen, looking out the patio doors, when I suddenly saw what I thought was snow, floating around my lawn. It was a fall of dandelion seeds! Oh great. There won't be a blade of grass left. I had a flashback to the time when I thought Dandelion "clocks" were magical and were there to be blown. On the other hand, they were also known as Pisseybeds, because if you picked them later that night you would...well, you catch my drift! I now realise that that was merely a tale made up by an old wife who was p***ed off with kids who were helping to disperse dandelion seeds all over her manicured lawn!